The Blog of the Hobbit: Win a Trip to New Zealand with the Super Ticket! Win a Trip to New Zealand with the Super Ticket! Advance tickets for the Ultimate Hobbit Experience go on sale November 21! 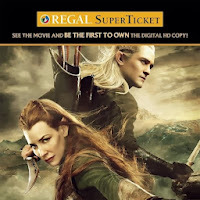 The Regal Entertainment Group is offering avid Hobbit fans a chance to win a trip to New Zealand! For a slightly higher fee than normal movie tickets ($20 above the normal price), you will receive a digital HD copy of The Hobbit: The Desolation of Smaug, the standard definition digital copy of The Hobbit: An Unexpected Journey, and you will also be entered to win a grand prize of the ultimate fan trip to Middle-Earth, courtesy of Air New Zealand! (There will also be second and third place prizes) Now who could pass up this fantastic deal! Find out more a the Regal Entertainment Group website.